THANKSGIVING PILGRIMS AND THE ROMANS? I’ve been thinking about this blog since I woke up this morning. I don’t know how it will turn out. I love Thanksgiving because of all the holidays we celebrate, the only one with any true biblical commandment is Thanksgiving. We are never told in the Bible to celebrate Jesus’ birth or his resurrection with holy days. We are, however, told to give thanks many times. So, for me, this is a religious holiday, which might be why “Black Friday” and shopping the day after Thanksgiving is so distasteful and evil to me. But I digress. For me it is religious, but for the vast majority of people Thanksgiving is a secular affair with parades and shopping and football. A new tradition has emerged though on the secular landscape. That tradition is the emergence of hand-wringing and guilty confessions of communal sin about the origins of the New World. Every year at Thanksgiving commentators and news analysts feel compelled to spell out how evil the holiday really is because of what the European settlers did to the Native Americans. For a particularly vitriolic and depressing rendition of the song and dance, click here. It is true that the Pilgrims and the early settlers did bring problems and displaced the Native Americans who were here when they arrived. However, from what I can tell, the archaeological evidence seems to indicate various waves of migration, settlement, and then displacement have occured throughout the history of North America. We are simply the first society to feel guilt over such displacement. This is good, as I do not think we should wash over the sins of our fathers and mothers. I just don’t think it is beneficial to replace the positives with all negatives. Likewise, it is not good historical practice to hoist the atrocities of white people in the 19th century onto the intentions and actions of the white settlers two hundred years earlier. But that is not the point of my pondering on this Thanksgiving Eve. 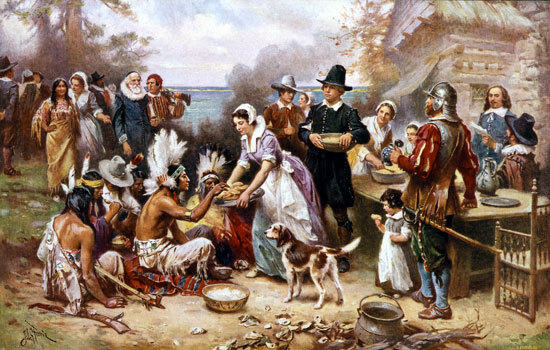 The Pilgrim story is the original “founding of America” myth. Upon that myth such principles of harmony, helping one another, gratitude, survival, and innovation are reinforced. Even if our ideals do not reflect reality, the myth of the Pilgrims and Native Americans in some part encourages us to live up to the pluralistic beauty of being an American. But that myth has been replaced with a version of the truth that says America was built on violence, greed, oppression, and genocide. Although I believe that is a gross overstatement, that is what many people would have us believe about our founding parents on Plymouth Rock and in the Massachusetts Bay Colony. That myth of violence and destruction is becoming the dominant view of America and the United States. What does that reinforce? It reinforces an angry, divisive, selfish, entitled, and jealous view of the world. Which myth do you think is better for us as a society? Which one helps us become what we want to be? How can we keep the truth of history and the ideals of our myths at the same time? The ancient Romans likewise had two competing myths of its founding. During the glory years of the Roman Republic, the dominant myth was that of Romulus and Remus. 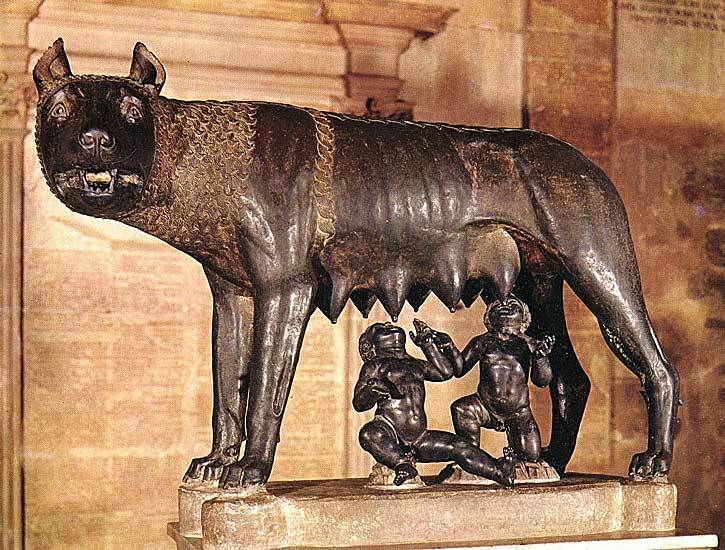 The struggle of the twins suckled by she-wolves supposedly resulted in the founding of Rome on the banks of the Tiber river and led in the formation of a government that rejected kings and embraced a type of republican government based upon debate, ideas, and votes. That myth was about as true and accurate as the Pilgrim myth is for the United States. Yet, it established the ideal. A new myth won the day when the Empire emerged and democracy was suppressed. This is the story of Aeneas. The poet Virgil wrote the Aeneid for the Emperor Augustus to explain the origins of Rome in different hues. Aeneas founded Rome, says Virgil, after fleeing Troy as a refugee following the destruction of Troy in the Iliad. It was the gods who willed the founding of Rome and of the Empire. As the empire grew, the Aeneas myth replaced the Romulus and Remus myth. The United States of America has become the dominant empire on the world stage. Yes, there are competitors such as China, Russia, and the EU but everything is predicated upon the leadership and stability of the American Empire and all those competing powers define themselves against the U.S. I prefer the republican (I use this term in the generic sense, not political sense) myth of our infancy when we as a people emphasized cooperation, harmony, survival, pluralism, and gratitude. It most certainly is a flawed history that people should be aware of, but it is the ideals–what we want to be–that matter. That is what I will choose to think about. I wrote this three years ago. It seems even more timely to me now than then. thanks for the kind words Alyssa! performers of the tv show.